Credit: By KamrenB Photography on Flickr. Some rights reserved. The social web has become the first port of call for many journalists in breaking news and researching stories. Relationships and face-to-face conversation are still vital, but when news breaks on the other side of the world you have your contacts, official sources and the web. 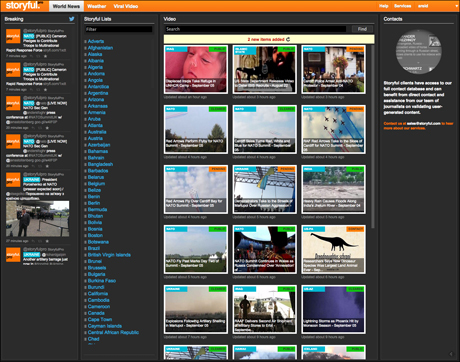 When it launched in 2010, Storyful sought to get journalists ahead of the curve as a newswire "purpose-built for the age of Twitter and YouTube" – finding, verifying and delivering breaking news stories and content from social media – and it recently launched an overhaul of its 'newswire' service to keep it up to date with the digital media's ever-shifting landscape. Adam Thomas, Storyful's chief of product, said the new dashboard for users is intended to make the process of finding updates and multimedia around specific stories "frictionless". "There was no way of filtering the breaking news stream," Thomas told Journalism.co.uk of the StoryfulPro dashboard, which is still accessible but being retired. "You had to go in and find the Twitter list yourself and monitor it, you had to then put in the search term for Islamic State [for example] in the video archive. "So three actions in three tabs. We thought this is crazy, people tend to get up in the morning and have two or three things that they tend to focus on. 'I'm on Ferguson', or 'I'm monitoring Ukraine and the NATO talks'." 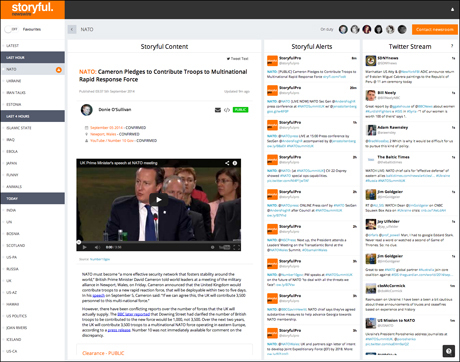 Instead, the newswire dashboard lets users choose from a list of topics, ranked by timeliness, and displays verified, usable multimedia; alerts from the StoryfulPro Twitter account and tweets from curated Storyful lists all relevant to the particular story. Depending on their level of access, users can choose from 'world news', 'weather' or 'viral video' in terms of the collection of relevant topics, or more verticals like sport or entertainment as Storyful further understands what its users are looking for. Trial accounts with Storyful are free upon request and users can subscribe to many of the company's Twitter lists, but further access and contact with the newsroom is a paid-for service. "We thought, lets group everything we have and we know," Thomas continued. "We always thought our newsroom is like an iceberg, there's so much happening and the guys are doing so much work and out of it comes a very good story. "But people don't see half of the verification and alert stuff, we've only just started exposing it and the amount of work involved." Journalism.co.uk has previously written about the custom-built software that helps Storyful journalists uncover breaking news: Heatmap, for scanning hundreds of Twitter lists and thousands of accounts around the world for keywords; the geo-specific Alertbot for establishing trends in certain regions; and Recommender, which suggests relevant Twitter accounts to populate new or existing lists. But the number of social and video platforms has multiplied since Storyful's launch, as have the priorities of news outlets and, increasingly, brands, in terms of what they are looking for from social media. "Video is core to the experience and in our previous newswire we hadn't really focussed on video," Thomas said. "But we've also been increasingly moving into other verticals – moving into trends, sport and entertainment – but also just using social a lot more. "A lot more tweets, Facebook videos, Vine, Instagram. All of those kind of things. Our old wires weren't quite fit for purpose and all of the new formats and verticals we really wanted to start hitting. 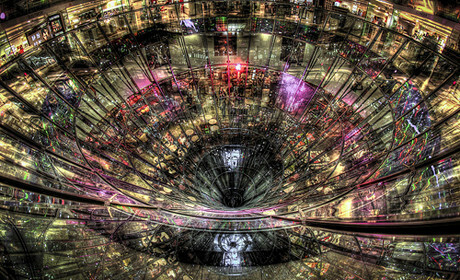 "But it's also about future-proofing for networks that we don't even know. [Russian-language social network] VKontakte and [Chinese-language network] Weibo, both of those feature in the newswire now so it was time for a change in that regard." Thomas went into detail on the new elements of the redesign in a blog post, but is it a reflection of changing trends in news? Or social media? Or both? "I think it's both," he said. "I think news to a large extent is becoming beat-focused. News organisations and journalists are being expected to own their particular area and help people understand it in depth and offer explainers..."
"We wanted to reflect that and the need of the modern journalist to write in that style. That's not really changed but it's become more evident and we wanted to make that easier to find." Update: This article has been updated to clarify Thomas's job title.